Welcome back fellow creative planners! This is Leah O’Neil from the Simple Stories creative team, joining you on the blog again today for the next installment of my Creative Planning blog series. In this series, it is my goal to demonstrate to you a variety of ways you can use and decorate your Carpe Diem planners. So far, I’ve shown you how I set up an overall wellness planner, and some of the ways I decorate my day-to-day life planner. Today’s post is about using a planner for memory keeping. Documenting memories is very important to me and brings me a lot of joy. These days, I don’t create many 12×12 scrapbook pages because I do all of my memory keeping in my planner and a traveler’s notebook. I like the ease of incorporating memory keeping into my planner since I already have it with me most of the time. You can dedicate a whole planner to documenting memories, or do what I usually do and mix it in with your day-to-day planning. Planning in itself is a form of memory keeping, because it can give you a glimpse of what your days look like in any given period of your life. 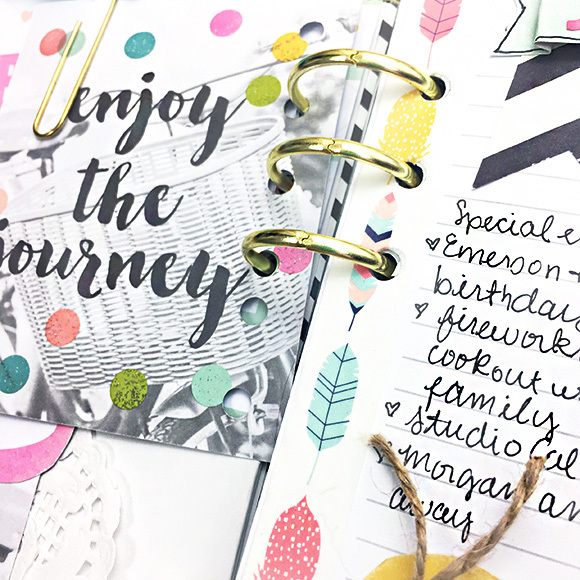 By adding some light journaling and a few accompanying photos, you can really up the ante when it comes to documenting life’s special moments in a planner. Back in June, I did a post on the Simple Stories blog showing how to incorporate pocket pages into your planner as a form of memory-keeping. You can read that post here. Today I have a video showing you how I use the Monthly intro page that comes with Carpe Diem planner inserts to document memories from the month. In the video below, I am doing some pre-decorating since the memories had not happened when I filmed. However, stay tuned for the photos at the end of this post to see the completed layout. Herere is what the completed layout looks like with added journaling and photos! After filming the video, I added the feather washi tape from the Simple Stories Faith collection. After filling in my photos and journaling, the white space on the edge of the page where the holes are located, made the layout feel a little unbalanced. So I added this washi tape to fill in the empty space on that side of the page. I love how the colors of the feathers coordinate so well with the new Carpe Diem collection. As a bonus in the video, I showed you how to quickly dress up a planner pocket folder that you can use to store stickers, or to store photos and on-the-go journaling notes until you’re able to sit down and finish your layout. This décor was super easy. I just made a little tag and layered it with a doily under a pocket card from the Dashboards and Pocket Cards set. The pink circle with the white heart was fussy cut from another one of the pocket cards. I embellished with some twine, word label stickers and enamel dots. The fun part about documenting each month’s highlights on the monthly intro page, is that by the end of the year, you will have created a little scrapbook. The inserts can be transferred and stored in a 6×8 SN@P! album for safe keeping. There are many ways to document memories in your planner. There is a lot more inspiration for doing this over on the Carpe Diem Planners Instagram! My rule of thumb is, whatever can be done in a scrapbook can be recreated in a ring bound planner. The only difference is that in a planner, you will want to be a little more mindful of not adding too much bulk. I hope you got some helpful ideas from this post and enjoyed the process video! I will see you all here on the blog again in September! What a fun way to safe keep your memories!